Once upon a time, there was a man who yearned with all his heart to explore the secrets of the Arctic. And, at his side, there was his wife, who supported him in all he did, even after he had set sail on his final journey to that "undiscover'd country / from whose bourn no traveller returns." And finally, "after long waiting, she herself departed to seek him in the realms of light." Readers will, I suspect, recognize the familiar elements of the story of Sir John Franklin and his wife Lady Jane, and the words from the monument at Westminster Abbey -- and yet, it is not not of them that I speak, but rather of Garth Walpole and his wife Alison. I'd come to know Garth via the “Remembering the Franklin Expedition” Facebook group, established in 2008 by Lee Preston. Garth was one of the first to join, and even amidst the many enthusiastic “Franklinites” who formed the core of the group, Garth stood out. He was generous with what he had, eager to obtain articles and imagery that he didn’t, and lively in the occasional, nearly real-time exchanges that were then – and still are – a feature of the site. Through these discussions, I learned a bit more about Garth: he was had been born in Hobart, Tasmania, known for its large public statue of Franklin, not far from Government House, where Sir John had once served as the colony’s Lieutenant-Governor. Garth, from what I understood, had always had a fascination with the past, but it was only later in life that the Franklin story became for him – as it was for all of us – such a delightfully persistent obsession. 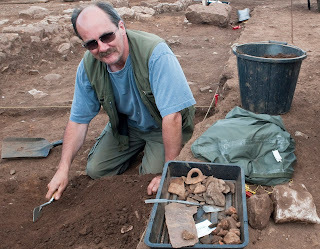 Working on his archaeology degree, he’d written a thesis on the Franklin relics that he was expanding to book-length; he’d shared some sections with me, as I’d shared sections of my own ongoing work. He was always especially eager to obtain new images of the relics, or resolve discrepancies in the archival records about them, and he and I would often exchange messages on such questions. And, when word of the discovery of Franklin’s ship got out, Garth had a strong intuition that it was the “Erebus,” not the “Terror,” but I wagered against him, telling him I’d “eat my hat” if I were wrong. And of course, he was right – I can still recall the taste of felt (though, in the interest of avoiding indigestion, a symbolic nibble had to make do for the whole). Along with the rest of us – perhaps more than any of us – he reveled in that discovery, and it energized his work. None of us had known, though, that he was already ill. It wouldn’t have been like Garth to say much about it; I imagine that he must have been a fairly private person, and didn’t want to be the recipient of online sympathy. And so we didn’t know, until his wife Alison posted a note to the group, letting us know that he was in the final stages of his illness and expressing his thanks for the companionship and encouragement he’d received from the group. Of course, we all responded with the same feeling, sharing our sense of gratitude and feeling of loss, and it was a comfort to know that Ali (as we came to know her) had passed along our regards. It came as a shock, though, how quickly the end came, and Garth was no longer among us. It was then that I undertook, at Ali's request, to find a publisher for Garth's manuscript. She sent it, along with all his notes and two large cartons containing all his Franklin books, so that I'd have all the resources he'd assembled as I edited and prepared the book for publication. I knew that it would be no easy task to find a publisher, and after nearly nine months of writing queries, I was beginning to doubt that I could. It was then that Glenn M. Stein, author of Discovering the North-West Passage: The Four-Year Arctic Odyssey of H.M.S. Investigator and the McClure Expedition, suggested I contact his editor at McFarland publishers in North Carolina. They accepted the project, and I was delighted to be able to let Ali know that I'd found a home for Garth's book. When I told her the news, Ali was overjoyed, as was I – although, by then, this joy was already tinctured with fresh sadness. For, in the time it had taken to find a home for the book, Ali had had a relapse of her cancer, and had already moved into hospice care. She was, however, able to pass from this world knowing that Garth’s book would indeed be coming out, and that his many years of work would not be for nought. And now, at last, it's available to the public. It will, I expect, have a special appeal to those first drawn to the Franklin story by the palpable melancholy associated with the Franklin relics, many of which are soon to be on display for the first time in over a century -- along with newly-recovered ones -- at the National Maritime Museum in Greenwich. 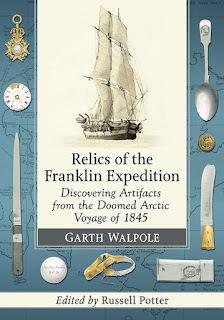 But there are many other aspects of the Franklin story on which Garth's careful archaeological examination sheds fresh light; his analysis of the earliest finds on Beechey Island is invaluable, as is his comparison of the various published accounts of the Schwatka search and its discoveries. The final section of the book offers an illustrated history of the relics as they were depicted in newspapers, magazines, stereoviews, and guidebooks. It demonstrates how significant these relics are, marking as they do the final evidence of Franklin’s men, of their boyish enthusiasm, their fortitude, their willingness to risk all on a voyage of unknown result. In a sense, they are not unlike those relics that mark our own everyday lives: eyeglasses, gloves, a button, or a bit of wool. They are, as with Franklin, only the fragments of a life, the remainders, the leftovers if you will. And yet, though inanimate, they have had, as Garth might say – extraordinary lives of their own. His book is their biography.